It has become evident over the last few weeks that the eurozone’s pro-austerity camp is trying to defend its record, either through the ground it is afforded by influential media or through commentators that end up resembling cheerleaders rather than sober judges of the events that have unfolded in the single currency area. Looking at the situation in a number of eurozone countries, and Greece in particular, it feels that those who believe that the policies followed since 2010 have been a success are describing some kind of parallel reality. Before explaining why, and to avoid any confusion about my motives for taking this position, it is worth establishing some facts. Let’s start with Greece: In 2010 it was a country that ran a budget deficit, not including debt servicing, in the region of 24 billion and a total deficit of more than 36 billion. On top of this derailment of public finances it amassed public debt that stood at 130 percent of its GDP after the government piled up 117 billion euros of new debt between 2004 and 2009. State expenditure had reached just under half of economic output and the public sector wage bill alone had increased from 21 to 31 billion euros in the same period. When you suddenly find yourself in situation where no market participant is willing to finance this type of fiscal binge you don’t have much of a choice but to cut that deficit. It also means you have to follow the painful path of international assistance programmes that involved the presence of the International Monetary Fund in your country. You are left hoping that those who finance the holes in your budget will not be too harsh. Failing to secure an assistance programme would mean having to wipe out a 24-billion-euro deficit and balance the budget in one fell swoop rather than over a few years. This would involve brutal levels of austerity. This is the impossible situation that Greece’s decision makers left the country following the early, largesse-filled years of euro membership. This much cannot be disputed. The debate must be about what happened from this point onwards. Because as much as those in charge of Greece’s finances carry the responsibility for the derailment, the conditionality the country has been forced to implement since 2010 has also had a damaging impact. Specific countries and institutions have been behind the consolidation programmes. They must also bear the responsibility for the economic devastation and social deterioration Greece has experienced. We should not allow the euro crisis years to form a new reality in which it is acceptable for a country to lose a quarter of its economy in a few years, see its unemployment rate edging towards 30 percent and have one in three living in material deprivation. This economic and social destruction is not acceptable. This is compounded by the fact that people often intentionally muddle it with the initial fiscal crisis so responsibility is not apportioned properly. Those that came to plug Greece’s fiscal hole and ensure smooth debt repayments had two intentions in mind: To safeguard the rest of the eurozone by ringfencing Greece and to make the program tough enough to deter others from seeing it as an easy option, as George Papandreou said Angela Merkel told him in 2010. Albeit with significant delay, the eurozone and, most importantly, Germany realised that financing Greece would be in their interest as a sovereign bankruptcy would open up all sorts of cans of worms. However, they also reverse engineered the austerity programmes. It was based on how much money they were willing to contribute and for how long instead of what pace was actually needed to get Greece’s finances in order without choking the economy and the population. European Stability Mechanism managing director Klaus Regling has explicitly stated that the pace of austerity depends on the “generosity” of those that provide the financing. Apart from the fact this approach overlooks the fact Greece has received loans rather than charity, it also runs contrary to the view expressed by the IMF. Throughout the crisis the Washington-based fund has been advising that "fiscal adjustment needs to proceed gradually, building on measures that limit damage to demand in the short term." It became evident during the European Parliament’s troika inquiry hearings that the pro-austerity camp’s arguments are wearing thin when its main defense is that if it was not for the troika Greece would find itself in an economic black hole. Giving member states the choice between the frying pan or the fire cannot be a sound basis for building a viable or prosperous currency union. It is also difficult to believe that the euro area’s lead country, Germany, can base such crucial policy decisions on the principle of moral hazard and a belief that a fellow currency union member can only be absolved of its past sins by going through a period of deep penitence. 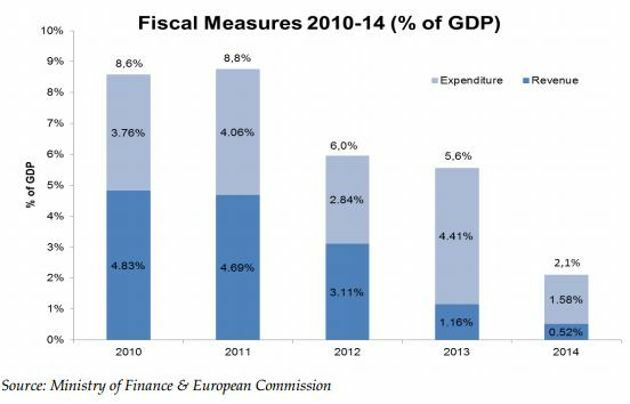 Ultimately, the eurozone did not escape the worst because of the “success” of the troika bailout programmes. Austerity’s cheerleaders have some cheek to argue that the approach followed in Greece and the overall tone set by Germany in the handling of the euro crisis has been vindicated. Their claim completely disregards the fact that until July 2012, and the famous “whatever it takes” from European Central Bank president Mario Draghi, the eurozone was heading for the rocks. 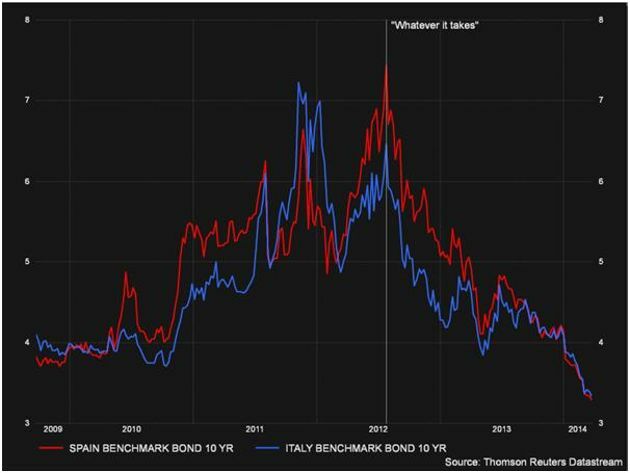 For anyone whose memory has been slipping, the graph below of the Italian and Spanish sovereign bond yields should act as a constant and undisputed reminder of how significant the announcement of the ECB’s Outright Monetary Transactions (OMT) programme was. It is also worth remembering that the one policy decision that has actually averted the euro area’s collapse was deemed incompatible with German law by the country’s Federal Constitutional Court, which has referred the matter to the European Court of Justice. Also, it should not be overlooked that Bundesbank chief Jens Weidmann argued vehemently against Draghi’s bond-buying scheme during the hearings at the Karlsruhe court. The pro-austerity camp has no victory to claim in the last four years. Instead they do have to answer for the misery they have caused across the eurozone periphery, In Greece they have been responsible for the most destructive economic project in history. But when you see the crisis only in terms of loss of market access, it is convenient to try to steal some of the glory from the central banker who averted a disaster. "We should not allow the euro crisis years to form a new reality in which it is acceptable for a country to lose a quarter of its economy in a few years, see its unemployment rate edging towards 30 percent and have one in three living in material deprivation." Face it Nick, this is indeed the new reality and Ukraine is next in line. In Ukraine, the EU, IMF and USA have joined forces to financially waterboard the country while opening the gates to 'our' multinationals stealing its wealth at miniscule prices due to the opportunity presented by Ukraine's economic crisis - sound familiar? - and the resulting coup d'etat openly and shamelessly engineered by USA and Germany (EU). Germany throughout the autumn of 2013 spearheaded the EU's toxic loan offer to Ukraine (which Yakunovitch wisely rejected) - in which a risibly small loan was proffered on condition of ALL of the above, PLUS the immediate closure of all Ukraine's industry. The extreme 'austerity' being imposed on Ukraine will be much more damaging to its (much poorer) population due to Ukraine's harsh winters and people's inability to pay for heating. Thus Greece, for a second time (the first being the relative restraint of the CIA junta in Greece compared to CIA actions in Argentina a mere 15 years later) may in retrospect see itself as comparatively lucky. Just as there is no judicial recourse for Greece to apply for compensation for the errors made and left uncorrected, so there is no ultimate adjucator to interfere in the outrageous events above. THIS is the new reality, and furthermore the coup-makers, law-breakers and carpetbaggers are "us". Mr. Tsigantes is well known for a very special view of the world. Although I also have some funded doubts about the actions of EU in Ukraine you should not be given a platform to insult everybody who is not genuine Greek sharing your view. And please do not forget that Greece (helped by expensive foreign consultants) screwed the numbers in order to become member of Euroland. Nobody in the north suggested Greece to do that - so do you see how all that misery got started?? 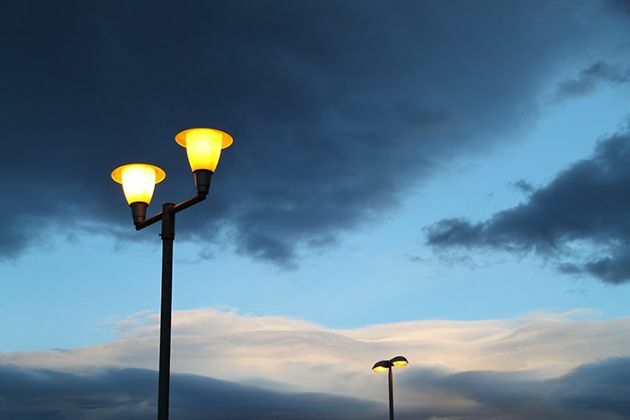 This article shows some strong points, but it lacks telling a solution to the problem. For various reasons the solution can not be giving even more money to Greece. Greece had its fair chance to implement long time required reforms of it's legal, political and administrative system. No foreign country can go into details of such reforms, it should have been done by Greeks! He has long years of successful experiences in this kind of financial affairs, but imho nobody in Greece is prepared to listen?